A car's paint must provide years of beauty in an environment containing harmful substances such as acid rain, fallout, dust, dirt, tree sap, and animal droppings just to name a few. Using a car cover not only protects your car's exterior, but it also protects your interior from harmful UV rays. 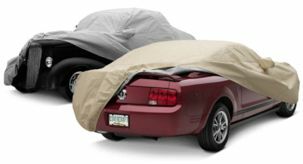 Selecting a car cover can be a daunting task, but there are many things you can consider to reduce your options. Budget - We offer a car cover to fit any customer's budget. Entry level semi-custom car covers start as low as $70.00, which a top of the line Covercraft custom cover can run over $500.00 a cover. Weather Conditions - Where you live plays an important role in choosing your car cover. Coastal areas require a car cover that can protect from and withstand salt air. In wet areas of the country, customers will require a car cover that is able to keep the water out, and allow breathability. In hot, dry, sunny climates, you need a blanket of UV protection. The cover must offer reflective properties to protect against photo degradation and keep down the heat. Frequency of Use - Choosing a cover for a daily commuter versus a hobby car is completely different. Likewise, if you garage your car at home or park it outside, you have different decisions to make. For your daily vehicle, your best choice is a lightweight outdoor car cover. If you park outside in a crowded area or where children play, an extra layer of protection will be beneficial. If you need an indoor cover for your Muscle, Specialty or Classic Car choose a slightly heavier fabric. These covers are designed to block more dust and offer a bit more padding for extra protection. Color - In sunny, warm weather climates a lighter colored fabric is essential for outdoor protection. Silver offers the best reflective qualities. If your vehicle is a light color then choose a cover with a light color.